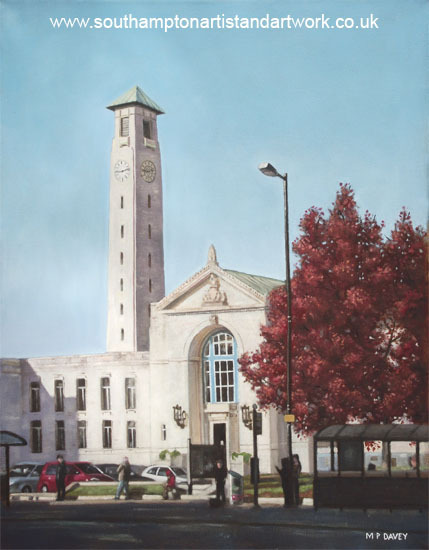 The painting is of Southampton Civic Centre during the autumn. It was painted in 2010 on a canvas, 20" x 16" in oils. The building is an art deco grade II listed structure, designed by Ernest Berry Webber. It contains a police station,art gallery, library, Guildhall and council offices. The painting does not shy away from the typical things found in the street. We have here cars, waste bins, bus stops, and even a parking zone notice. The artist thinks these everyday items things seem to add character in a painting! The painting is in oils on a 16"x20" canvas.